Okay, I know last year I said I wouldn't do it again but I can't help it. Two years ago Mom & I landed in Aktau to meet the baby that would become my "Lexie." I've been trying to remember what I thought she'd look like or be like or feel like.....and I can't. I didn't really "see" her in that way. I knew whoever GOD had chosen would be the perfect child for me. I also remember being stressed out, anxious, frustrated and disappointed BEFORE getting on the plane, what with all my delays and issues along the way. But what person going through international adoption hasn't felt the same thing at some point during the incredibly long agonizing process? Then once we actually took off it was almost surreal. Surround by people from so many different nations, speaking in languages I couldn't even name let alone understand made even the flight feel like I was already in a foreign country. Then getting off that plane, not being able to read or understand a word being said just added to the experience of being totally out of control of the situation. When one of the bags and the baby stroller didn't make the flight and I was asked by the customer service person where I was staying so they could have it delivered and I didn't know....WOW - talk about having faith that GOD was traveling with us and would make sure we were taken care of. Looking back I really never questioned if someone we could trust would be there to pick us up and take us to a safe place to sleep. I mean, we are talking about COMPLETE strangers half way around the world in a country I can't even speak the language in. And these same strangers are going to guide me to the most important person in my life - my child!! That is the trust and faith and total belief in the power of GOD that International Adoption is based on. Especially in Kazakhstan where you are required to travel BLIND. Most other countries you have pictures and maybe a video or at least information on the child's age and health. And you are assured that that child will be waiting for you when you get there. That certainly seems to give parents a little more feeling of control. In Kaz you are assigned a city where they say there SHOULD be a child that is close to what you where hoping for and then you get on a plane and go....BLIND...blind faith, blind trust and complete belief that GOD is walking beside you every step of the way. You are where he wants you to be and HE will take you to the child HE has chosen for you. Amazing, really. I agonized over what to pack and organized for months who would take care of the dogs, the house and my business and joyously set up a bedroom for this child to come home to. But looking back now I never really questioned if I'd bring the RIGHT child home to that nursery. After all, GOD was with us on that plane and walking down that long hall at the baby house so how could I question who they put in my arms. I mean, I could have chosen any one of the 4 babies brought into that cramped little visitors room two years ago but I knew even as anxious and emotional as I was, that somehow everything would finally turn out as it was meant to be. 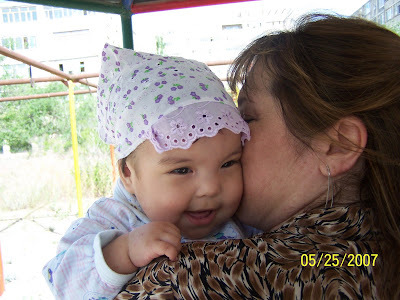 That the child I had dreamed about since I was not much more than a child myself was in that room on Friday, May 25th in Aktau Kazakhstan because GOD had chosen her for me and me for her. I was her mother and this was just GOD's creative way for us to become a family. Anyone that knows me, knows that I don't do things like other people do so why should I go the normal route for creating a family? The worst moments I had in Kazakhstan were when I went to the apartment that night after our first visit and questioned it - the whole thing. I talked to Mom and said this child didn't feel like my daughter and what was I doing half way around the world agreeing to raise this child. Mom being Mom just said wait. Give it a few more days and then see how it feels. Even on the ride over to the baby house the next morning, I was thinking I'd give her through the weekend but if it still wasn't right then I was calling my agency. Once we got to the baby house we found the entire population of babies outside because they were fumigating the building. And there, through this sea of little faces, I saw this angel smile at me. That was it. She was my Lexie. It must be how a woman who gives birth to a child feels when they lay that child on her chest to hold the baby for the first time....MINE. That's what I thought. She's mine and GOD brought us together in this special way. So I must give thanks to GOD for my baby and say Happy Two Year "Born to Me Day" Lexie! PS - I did NOT set this shot up. 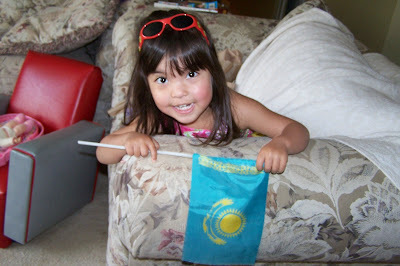 She grabbed her "Kaza" flag as she calls it off her bookshelf in her room and was running around with it. She must have felt the connection to Kazakhstan today just like I did!